Now here’s a new and interesting product for deck contractors that came across the PRWeb — an online Press Release service. As an alternative to traditional re-decking materials, AZEK pavers can be used as a ‘hardscape solution’ for outdoor spaces including decks. Here at Archadeck, we think that AZEK deck flooring pavers certainly show potential and will open-up some unique possibilities with deck design and building for St. Louis homeowners. The new product is available in three different paver profiles and in five different colors including Boardwalk (brown), Olive (green), Redwood (deep brick tone), Village (lighter brick tone) and Waterwheel (gray). Like other AZEK decking products, the pavers are built with durability in mind and designed to withstand every day ‘wear and tear’; however, they are lighter weight when compared with traditional pavers. Installation is touted as fast and easy, using a grid system to eliminate the cumbersome installation task involved with traditional masonry pavers. 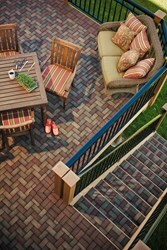 And there’s more… AZEK decking and trim were just listed in Builder’s Magazine Reader’s Choice for great products. If you reside in the Greater St. Louis, Missouri area and you’d like to learn more about the diversity of the AZEK decking product-line for a new, resurfaced or remodeled deck, just give us a call 636.227.0800, Archadeck of West County and St. Charles County. 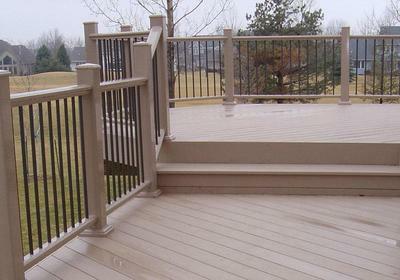 Archadeck is a leading St. Louis contractor for decks and other outdoor living spaces. Our preferred supplier partnerships include AZEK, TimberTech, Fiberon, Deckorators, Westech and other leading manufacturers in the industry. Editors Note – July 2014: AZEK has just been featured in the Summer 2014 issue of Outdoor Living Magazine for diverting more than one million scrap tires from landfills. For other ideas too, check out our new Pinterest board ‘Simple Tips for Green Outdoor Living from Archadeck’ .